Running campaigns without configurable attribution is like driving your car in first gear only – you’ll eventually get where you’re going, but you’re only using a fraction of the car’s power and killing its efficiency. (Plus, it’ll be extremely boring). Configurable attribution is one of the most powerful tools at an advertiser’s disposal and Kochava offers the most robust controls available. The Kochava Attribution Engine is unbiased, comprehensive and immediate. By considering every available data point (impressions, clicks, installs and events) before determining the winning engagement, the attribution decision is final. This decision is then actionable via real-time postback, data syndication, and reporting. Attribution factors, in order of priority, are lookback window, match integrity, click time, user intent, and single-chance attribution. By matching your lookback window configuration to your MTTI (mean time to install) by partner, you can ensure that your lookback window is set at the optimal point before your campaign reaches diminishing returns. These can be set by campaign and by network. For example, games tend to have a relatively longer MTTI than other categories. If your MTTI on Network A is 30 hours, you can set your lookback window for Network A to 3 days to attribute the majority of new users to that campaign. This allows you to optimize campaigns without wasting dollars waiting for the stragglers. Acquiring high-intent users can be expensive. By employing a shorter lookback windows, you increase the likelihood that you are only paying for the users with the highest intent. Getting up-to-speed with a new network and earning priority placement takes time. By increasing the lookback window, you can ensure that every possible conversion is attributed to that network, thus gaining traction and earning prioritized network traffic. IP Only Fingerprinting – only the IP address is considered, the user agent is ignored. Both of these configurations has its unique advantages and impacts the relative integrity of an attributed match as well as the balance between attributed and unattributed installs and events. If attribution integrity is your primary goal, full fingerprinting is the best option. This requires that users are on the same IP address and have the same user agent in order to be attributed. The addition of the user agent accounts for issues where many users are using the same corporate network and thus show the same public IP address. If you want to serve ads on mobile web or even desktop traffic, but measure mobile engagement, IP Only Fingerprinting is a good, balanced configuration. For example, if a user clicks on an ad on their home or office wireless network and then launches the app on their mobile device, connected to the same network, the public IP address will be the same, but the user agent will be ignored. Thus, the click from a desktop computer can be matched with the install on the mobile device simply by matching the IP address. There are cases when the user agent may be mangled or changed based on the way some networks or site IDs handle it. This can result from issues between an app and a publisher SDK, or sometimes a network’s server-to-server integration can overwrite the device’s user agent with its own. In these cases, IP Only Fingerprinting allows you to continue attributing installs while the problem is remedied. 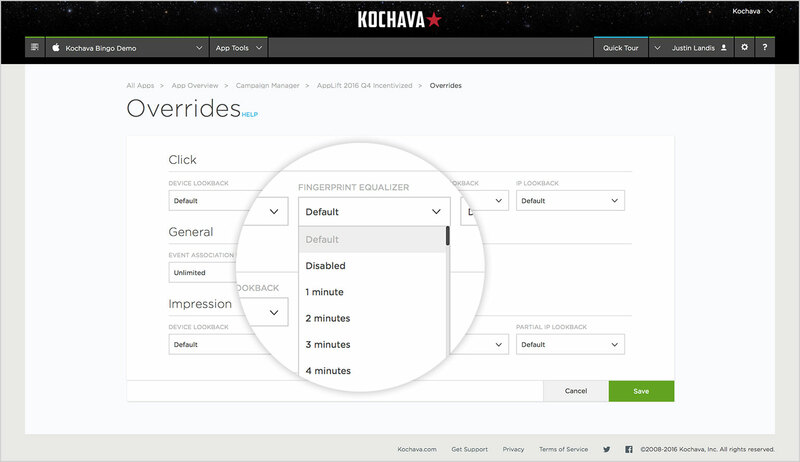 Configurable attribution is one of the most powerful tools at an advertiser’s disposal, and Kochava has the most robust configuration available. Device reconciliation is the highest-integrity match type available. Device reconciliation happens when the device ID received on click or impression matches the device ID on install. This level of match integrity is attained in 3 ways—raw device matching, progressive reconciliation and Self-Attributing Network claims. A raw device match happens when the device ID collected on install, which is always raw, matches with a raw device ID received on click or impression. This is the simplest scenario and is possible if a raw device ID is received on the click or impression. But what happens if the device ID received on click or impression is hashed unexpectedly through traffic rebrokering, or gets mangled in some way? For these cases, Kochava developed Progressive Reconciliation. 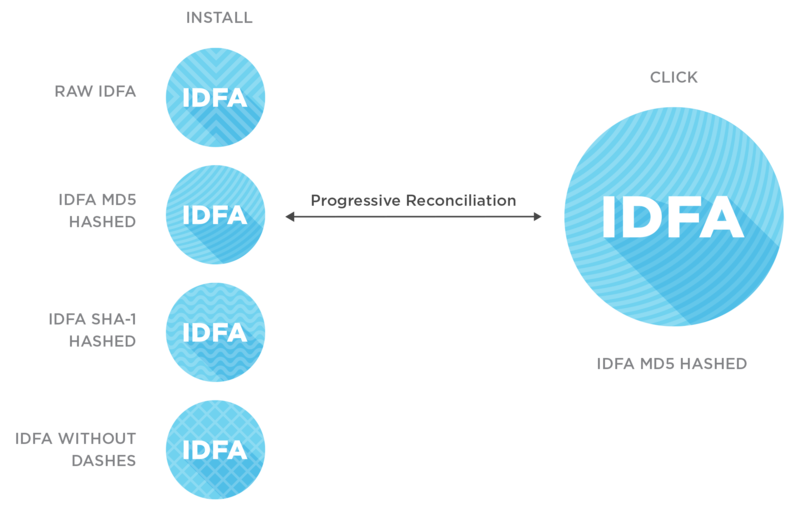 Progressive Reconciliation is a process by which Kochava takes the raw device ID collected on install and creates 36 variations of that device ID, based on typical alterations made by networks and publishers. The methods by which the variations are created include hashing and double hashing (SHA1 and MD5) adding and removing punctuation (dashes, colons, etc. depending on ID type), making the ID uppercase or lowercase, and creating combinations of all of these. These permutations ensure that all variations of a device ID—intended or unintended—are available for matching. This combination of raw device matching and Progressive Reconciliation allows Kochava to attribute every available install on device ID. The final method for device reconciliation is via Self-Attributing Networks or SANs. Self-Attributing Networks are large networks with high-value traffic, which have unique integrations with Kochava. Each SAN receives a postback feed of all installs for apps running traffic on the network. If the SAN has a click that is eligible for attribution, the SAN responds with a claim and a click time. Kochava reports these installs as well as putting them into the larger context of all live campaigns. Self-Attributing Networks include Facebook, Twitter and Google. In previous installments of the Configurable Attribution story, different configurations have been tied to specific goals. This Device Reconciliation story is more about exposing the inner-workings of the Attribution Engine than highlighting configurable options. Over the next 2 weeks we’re going to discuss how to digest reporting and the ins-and-outs of View-Through Attribution. Stay tuned. While the mobile ad space is certainly still developing, most advertisers understand the importance of tracking clicks and installs. Savvy advertisers use these data points to streamline and optimize their ad spend. Some of these same advertisers are also tracking impressions to understand their click-through rates (CTRs) as well as adding a layer of accountability to ad-network reporting. Impression tracking is available through a few mobile attribution & analytics providers.Tracking impressions is only the first step. The real insight comes with impression attribution or view-through attribution. There are several reasons why view-through attribution is important. View-through attribution is the capability to credit an install or in-app event to a specific impression. This also enables insight into the influence impressions have on downstream engagements. Attributing clicks to installs is the first step to understanding mobile ad effectiveness, but it does nothing to uncover the truth of click-through rate (CTR) or effective frequency. The only way to understand these metrics is by tracking impressions in addition to clicks, installs, and events. Part of what creates a healthy ecosystem is transparency. Historically, only ad networks have had any insight into impressions served. By introducing 3rd-party tracking into the process, an independent source can verify impression volume and effectiveness. In the same way that click attribution rules can vary between networks, impression tracking and view-through attribution include a variety of configurable aspects. Ad networks count impressions in different ways and attribute based on different criteria. Configurable view-through attribution puts the controls around defining an impression and the rules for attribution into the hands of the advertiser. There are several reasons why advertisers should be leveraging view-through attribution. Gaining insight into brand lift. As marketing budgets continue to shift toward mobile, brands need a way to measure lift outside of installs and post-install events. For example, Vizio may have a companion app for their devices, but they really want to sell hardware. By simply tracking impressions, the Vizio team can understand the reach of their ad budget, independent of driving installs. 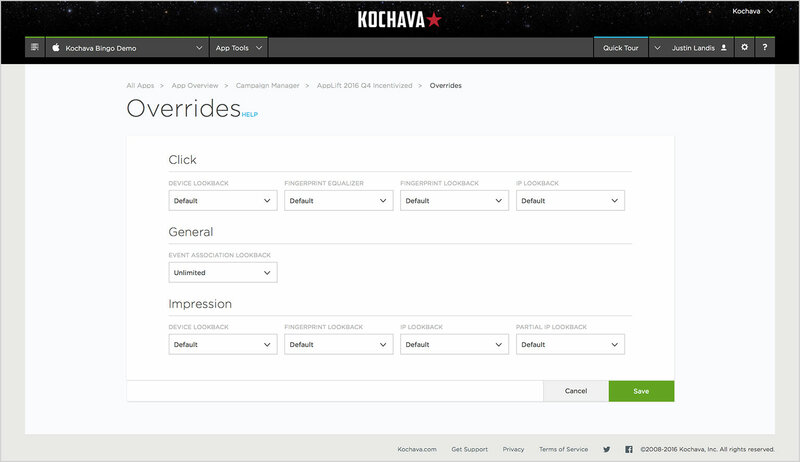 Additionally, view-through attribution with Kochava includes full influencer reporting. This insight can tie impressions which happened outside the configured lookback window, to an app install. Thus, Vizio can see how many times a user saw their ad impressions before installing the companion app for their device(s), which means they made a purchase. Understand the CTR of a campaign. By tracking impressions as well as clicks, the advertiser can understand the relationship between how many times an ad is served to when a user clicks on the ad. Catch users flying under the radar. As hyper-personal targeting increases, a segment of users independently pursue a product without clicking on an ad to avoid retargeting and overwhelming ad personalization. View-through attribution allows you to attribute an impression to a user behavior without the user ever clicking on the ad. Understanding the comprehensive impact of your mobile campaigns requires measuring every possible influencing aspect. View-through attribution provides insight into every aspect of user behavior connecting the dots from ad impression all the way through post-install activity. When it comes to your ad strategy, view-through attribution is the missing piece. For a list of networks that support view-through attribution, check out https://www.kochava.com/new-network-integrations/. Now that you have a handle on how to leverage configuration, let’s look at the resulting reports and how you can use them to further optimize your configurations. If you’re doing active user acquisition or monetization, you are already looking at reports on a daily basis. However, there are a few specific metrics you may not be considering including mean time to install (MTTI), mean time to action (MTTA), and Influencer reporting. MTTI and MTTA are two of the most interesting and under-leveraged metrics in the user acquisition and monetization space. These data points reveal the statistical mean for how long you can expect users to take between click and install/action to reach the desired conversion point. This analysis can be at the app level to give you insight into your audience’s behavior, and at the network level to fine-tune your attribution configuration. Now you can optimize your lookback windows to reach the maximum audience, while avoiding the point of diminishing returns. For all intents and purposes MTTI and MTTA give the same insight: MTTI for install campaigns and MTTA for reengagement campaigns. In the following examples, we’ll look at MTTI, but the same examples exist for MTTA. For example, if the MTTI for your app is 30 hours, that tells me that the majority of my users wait approximately between 1 and 2 days to launch the app, after downloading. You can then compare your MTTI for the app to MTTI by network to start tuning your lookback windows. If your MTTI or MTTA for Network A is comparable to your app (~30 hours) then you can set your lookback window to 3 days without missing much traffic. 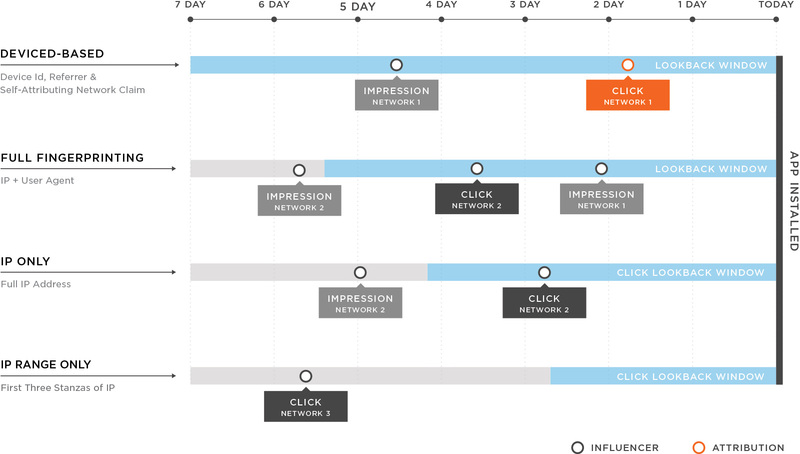 Now you can look at a 3-day cycle on campaigns for quicker optimization. Conversely, if you see a network with an MTTI much lower than your app, it means that users are launching the app much more quickly on this network, than on average. This may indicate that there is a publisher within the network which is mixing incentivized traffic in with non-incentivized traffic. This also happens to be a simple example of what Kochava Fraud Detection uncovers. Two other critical pieces of intel to review are the Influencers and Influencer Summary reports. These reports show which networks are driving traffic and clicks, despite not having the winning click. Influencer reporting gives data about the click including the reason it did not win. Reasons may include being outside the lookback window, not being the last click, or being superseded by a higher match-type (device-based beats fingerprinting, for example). You can consume Influencer data at an aggregate level (Influencer Summary) or at the device level (Influencer Report). These reports give you the actionable intelligence needed to manage your budget and ROI based on networks that are driving traffic, independently of whether they are winning attribution for installs. The importance of influencing networks. Sometimes partner-level configurable attribution is not granular enough. That’s why Kochava created tracker-level attribution configurations. All of the configurable aspects of attribution are available to configure for each tracker. This is a critical piece of the puzzle for anyone running different types of campaigns on the same network. These configurations can also be used to create different attribution settings for separate creative types, or even separate creatives. For example, if both video ad and banner ad campaigns are live on a single network, attribution settings can be configured accordingly. For video ad campaigns, lookback windows should longer to account for the greater effect video ads have on users. However, for a banner ad campaign, a short lookback window is critical, especially for impressions, as they are not as impactful to the end user. Not all traffic sources are created equal. They have different tech capabilities and audience targeting capabilities. Savvy advertisers take advantage of all available media sources. 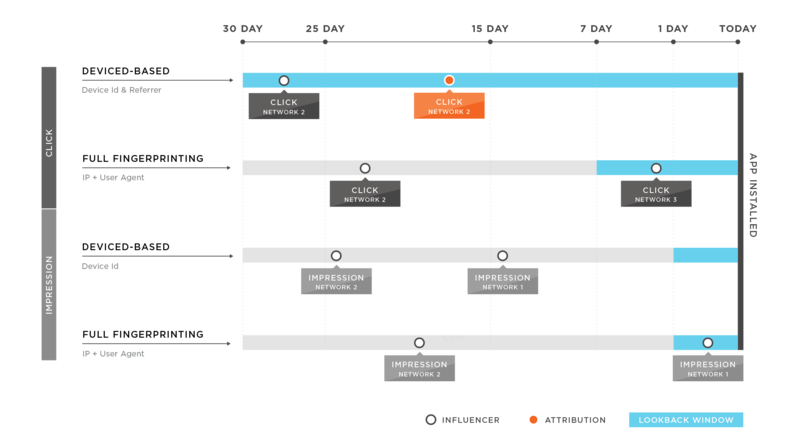 In the attribution world, waterfall prioritization of the winning click is based on both recency and match integrity. This makes sense in the ecosystem and works to reward publishers which are able to pass device ID on the click so that there is no doubt of the integrity of the match. But what about traffic that performs well but does not include device ID, like mobile web traffic? Historically these publishers’ clicks will always lose out to clicks with a device ID. This may result in lower-than-expected conversion rates and deprioritization of your campaigns. Fingerprint Equalizer allows you to define a timeframe (configurable from 1 minute to 30 days) during which fingerprint matches are given the same priority as device-based matches, leveling the playing field for a given time. This allows mobile web or other fingerprint-based traffic to prove its worth without losing by default based on lack of a device ID. Attribution has historically been awarded to the last click before an install. Kochava introduced Influencer Reporting to shed light on the other ads the user clicked on. Influencer reporting is critical to understanding the true impact of your campaigns. Though influencer reporting is informational and provides invaluable intelligence to advertisers who want to see more than simply the last click responsible, it also laid the groundwork for Fractional Attribution. Fractional Attribution empowers advertisers to define weighted value to different partners based on their attribution position. 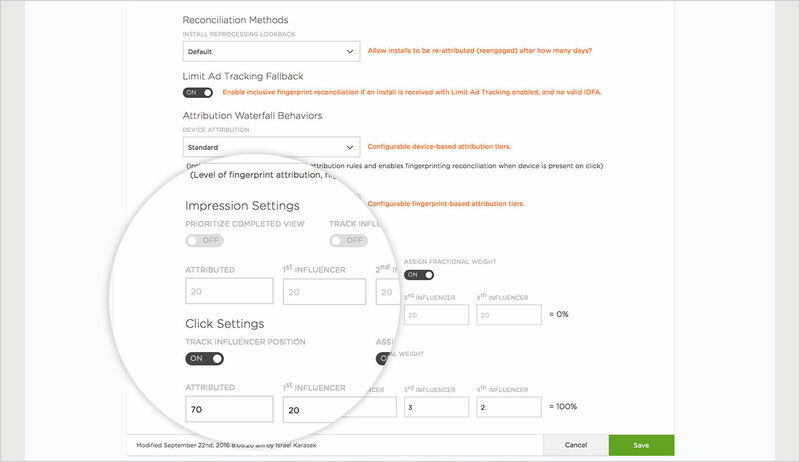 Fractional settings are available for both impressions and clicks. The defined weights are available via reporting to give additional context to a simple Influencer analysis. Additionally, Kochava appends fractional credit to postbacks for companies with the ability to receive and ingest. While Fractional Attribution is undoubtedly the future of app attribution, industry adoption is slow as companies build the required infrastructure to ingest and process attribution claims on a fractional basis. Kochava acknowledges the complexity of the space and gives customers deeper insight into influencing networks as well as paving the way for truly distributed and fractional attribution credit. The Kochava attribution engine is designed to be authoritative, comprehensive and final. Once a device has installed an app with the Kochava SDK, subsequent installs of the same app will be deduplicated. This is one of the ways Kochava ensures that users cannot game the system by installing an app many times and drive up install numbers. However, there are instances wherein it would be advantageous to reattribute an install. For example, if a user has been dormant for an amount of time, an advertiser may want to target them with a reengagement campaign. The configurable install reprocessing lookback defines the length of time after which an install may be reattributed. The default configuration is that once an install is attributed, it will never be reattributed. 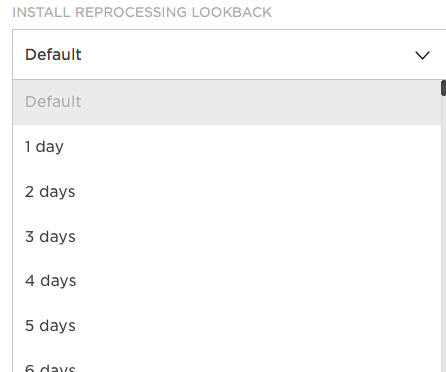 The install reprocessing lookback window is configurable from 1 to 365 days.